Mott’s Devin Foster drives to the basket against Alpena Thursday night. FLINT, Michigan — The no. 9-ranked Mott Community College Bears earned an extra game on the schedule thanks to Thursday night’s blowout win over Alpena. Mott’s 99-48 victory over the Lumberjacks clinched the Eastern Conference championships for the Bears (26-3) and the right to play in the MCCAA state championship game on Saturday at home versus Glen Oaks at 3 p.m.
It’s an unlikely outcome for Mott, as the perennial powerhouse of the MCCAA appeared to be on the outside looking in after a pair of tough road losses to Wayne and Oakland. Mott sat in second place and not in control of its destiny for over a week. Then the MCCAA stepped in and cited first place Oakland for a playing an ineligible player in the team’s last three games. The player, sophomore James Chappell, has been suspended as has Oakland’s head coach, Antoine Joubert. I have sympathy for Oakland’s players, as this was a serious oversight on the part of Joubert and his athletic director. Perhaps it wouldn’t have mattered though, after Oakland went down to Wayne on Thursday night and got beat up, 91-68. Mott Community College, ranked ninth in the latest national poll, is now back in the driver’s seat for the MCCAA Eastern Conference regular season championship after Oakland CC was forced to forfeit three games — all victories. Oakland’s conference record is now 13-4. 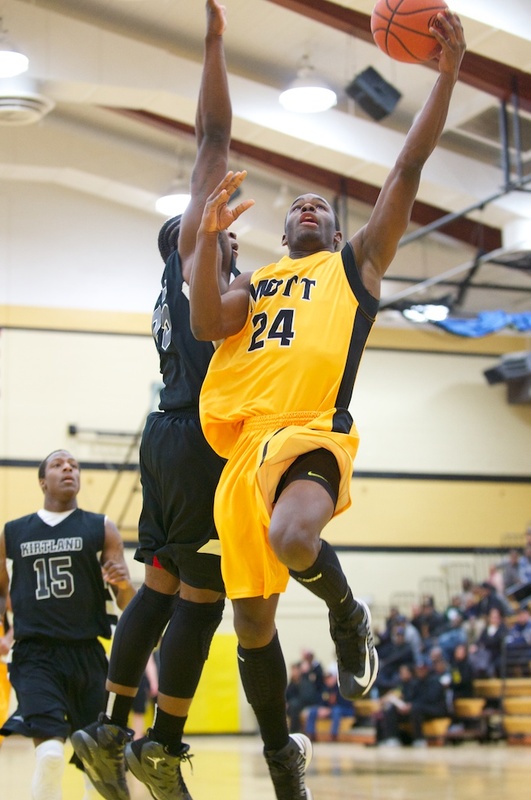 According to MCCAA official Tod Hess, Oakland Coach Antoine Joubert played an ineligible player in three games. The player, James Chappell, did not serve his NJCAA mandated suspension after he was ejected from Oakland’s game versus Mott on February 16. In his first game after being ejected, Chappell started and scored 10 points with 10 rebounds in Oakland’s 4-point win over Delta. Three days later, he scored 12 points with eight rebounds in a 12-point win over Macomb. Oakland, now in third place, will take on second-place Wayne on the road tonight at 7:30 p.m. Mott will take on Alpena at home tonight, also at 7:30 p.m.
Mott (25-3) trailed 4-2 against Schoolcraft on Saturday afternoon in the game’s first two minutes. The next 38 belonged exclusively to the Bears. Mott sophomore Kory Billups led the no. 10-ranked Bears on a 48-14 run to end the half and ultimately to a 96-46 victory. Schoolcraft, a team that blew out Kirtland less than 24 hours prior to Saturday’s game, were dominated by the Bears defensively — held to only 16 points in the first half. To start the second, the Bears immediately embarked on a 20-0 run to put the road team up 70-18. One major bright spot for Mott is the play of freshman guard Malik Albert, who has officially broken out of his late-season scoring slump. Albert hit six 3-pointers en route to a game-high 26 points. 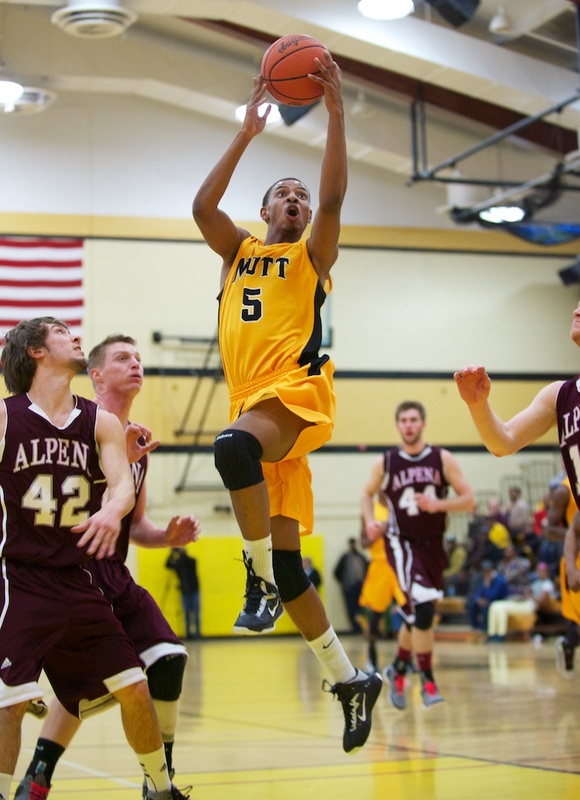 As a team, Mott shot an unreal 64 percent from the floor and held Schoolcraft to 26 percent. The Bears compiled 30 assists on their 39 made field goals. Billups turned in another solid all-around performance with 21 points and six rebounds. Freshman center Coreontae DeBerry scored 16 points with eight rebounds and three blocks. 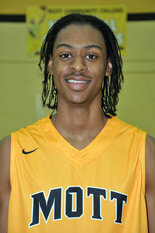 Richmond Jackson led Schoolcraft (6-20) with 12 points. After the game, Schmidt also expressed some chagrin at his team’s recent freefall in the NJCAA national poll. The Bears are ranked 10th despite having a better overall record than many of the teams ahead of them in the poll. They have also beaten no. 9-ranked Moraine Valley head-to-head. Mott will finish off its regular season schedule at 7:30 p.m. on Wednesday night at home against Alpena. SWARTZ CREEK, Michigan — I have literally lost track of all the high school basketball games I have been to in my life. From sitting on my dad’s shoulders as a kid watching Glen Rice at Cobo Hall to coaching from the sidelines, I have seen a lot of them. However, I would be hard pressed to think of any one moment that topped the one I saw at Swartz Creek Friday night. It wasn’t a JD Tisdale monster dunk (although there was one). It wasn’t a Max Cummings bomb from beyond the arc. It wasn’t Matt Romano going nuts for 28 points and a plethora of low post moves. It wasn’t even young Bryce Jenkins showing his growth while scoring in a variety of ways. No, it was a far bigger basket than that. It was one that reached further than the basketball courts and resonated in our hearts. It was the one shot and score by Swartz Creek’s Tristan Heinz. On senior night, Tristan led the Creek team out onto the floor. He led the team on the shoulders of Tisdale in the pregame huddle. Tristan was announced as the final member of the starting lineup sporting red Creek shorts and a white #10 jersey. Barely reaching the waist of Creek’s tallest player, Shawn Brouwer, Tristan still looked like he was right where he belonged. You see, Tristan lives with the condition of dwarfism that has stunted his physical growth. The look on his face in those moments told me his emotional growth was at 50 feet tall. Swartz Creek conceded the jump ball and first score to Kearsley in a prearranged move. That was followed by the best moment of the game. On his third attempt, Tristan sank a 10 foot basket to the delight of every attendee. I literally had chills in the moment and it struck me that it was indeed better than any moment I had seen in all of the games this year and maybe ever. I don’t know who originally came up with the idea, but whoever it was deserves a thank you from us all who were fortunate to be there. Coach Scottie Wright and Coach Paul Adas both deserve kudos for seeing this though as well. The game was anticlimactic at best after that. Kearsley used a 20-point fourth quarter to pull away from Creek for the final scoring margin. Romano was a man among boys this night with his career high 28 points and 10 rebounds to lead Kearsley. Jenkins added 14 as well. Cummings led Creek with 18 points and 10 rebounds despite a nasty fall and hitting his forehead on the ground in the second quarter. That fall happened just after Tisdale returned from injuring his right ankle coming down from a dunk on a defender’s foot in the first quarter. Tisdale finished with 14 points and 10 rebounds as well. Cal Henry threw in 8 points in too. FLINT, Michigan — One could only sit back and feel sorry for the Firebirds of Kirtland on Wednesday night. The team, with only five players suited up, traveled two and a half hours down I-75 only to get mollywhopped by no. 10-ranked Mott (24-3). Mott, fresh off two road losses to the MCCAA Eastern Conference’s top competition (Wayne and Oakland), ran roughshod over the Firebirds after playing a competitive game in their gym just last month. Mott was paced earlier by the stellar all-around play of sophomore Kory Billups, who scored 20 points with four rebounds and four steals. The 6-3 swingman from Chicago had three steals in the game’s first three minutes. The Bears led by 27 points at the half, excited the crowd with a few dunks in the second and cruised to the victory. Sophomore forward Fred Mattison had 20 points (two dunks) with 13 rebounds and four assists. Freshman guard Malik Albert had 17 points with five steals and three assists. Freshman center Coreontae DeBerry added 10 points including one monster dunk. Three teams from the MCCAA are now in the top ten of the most recent NJCAA poll. 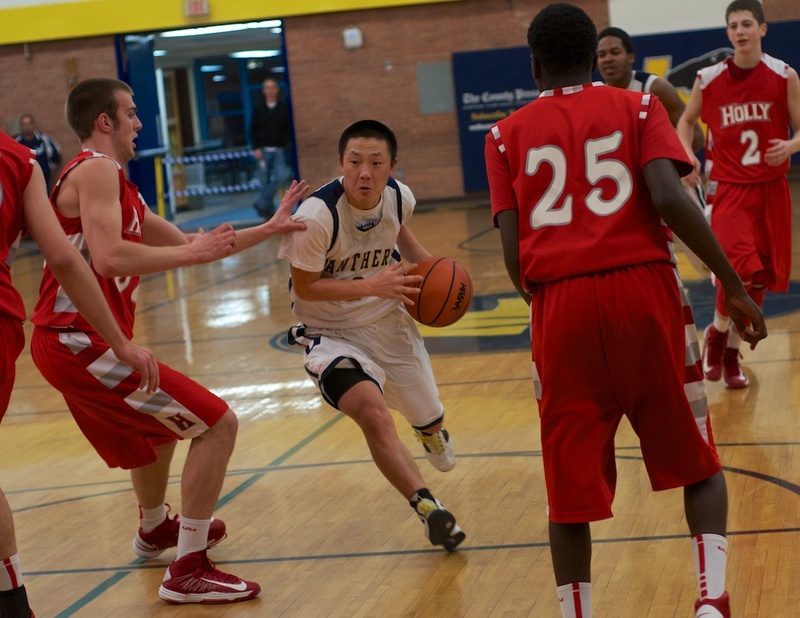 Mott, coming off two lackluster road performances against Wayne and Oakland, fell to the no. 10 spot after starting the season at no. 1. 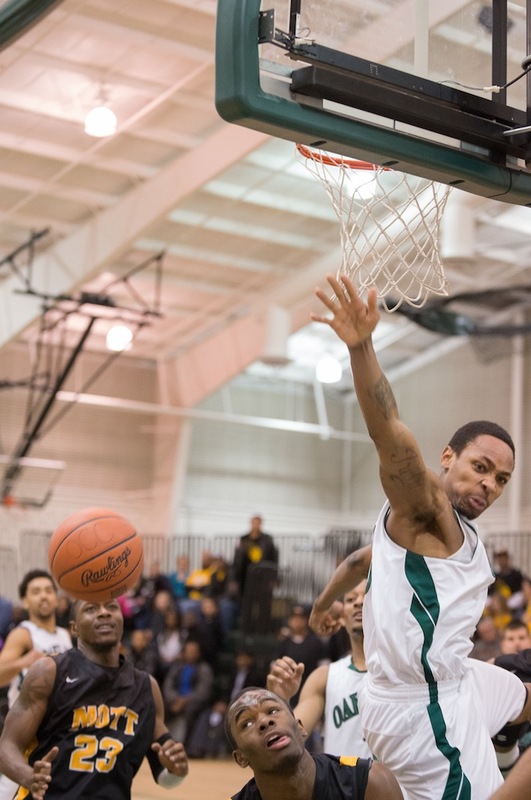 If both Oakland and Glen Oaks win out, those two teams would meet in the MCCAA championship game on March 2. 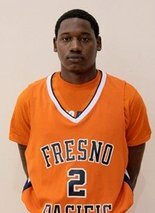 Former Mott Community College All-American guard John Taylor has become a dominant force at Fresno Pacific University in California. The 6-foot-1 junior is leading the PacWest Conference in scoring by an unbelievable seven points per game (25 ppg). Taylor is the best pure scorer I’ve ever seen at the JUCO level. On Saturday afternoon, Taylor poured in his season-high to lead his team to an easy win. The shocking thing to me is that Taylor is lighting up the NCAA D-2 ranks at a more feverish pace than he did at the JUCO level. Fresno Pacific beat Academy of Art 116-80 Saturday in a men’s basketball game that included a 44-point performance for one player and a triple-double for another. The Sunbirds were led by junior point guard John Taylor, who scored a career-high 44 points, hitting four 3-pointers, and also going 18 for 20 from the free-throw line. Taylor fell two points shy of the school record for points in a game. set by Don Jones against Vanguard in 1969. AUBURN HILLS, Michigan — No. 3-ranked Mott lost its second straight road game on Saturday afternoon to Oakland, formerly the second-best team in the MCCAA. No. 15-ranked Oakland’s 79-68 win now puts the Raiders in the driver’s seat for the MCCAA Eastern Conference championship. And it wasn’t a fluke. Oakland controlled the pace of the game throughout, led by a career performance from sophomore forward Darius Stevens. The 6-foot-6 inside-outside threat came off the bench and scored a game-high 28 points on only 12 shot attempts. He also added eight rebounds. His was one of the better clutch performances I’ve seen at the JUCO level. The Bears had no answer for Stevens down low and failed miserably to pick up the slack in the backcourt. The Bears’ starting guards, Malik Albert and Devin Foster, struggled throughout the game. Albert scored six points with seven turnovers and Foster managed only seven points with one assist. The pair combined to shoot 3-for-14 from the field. 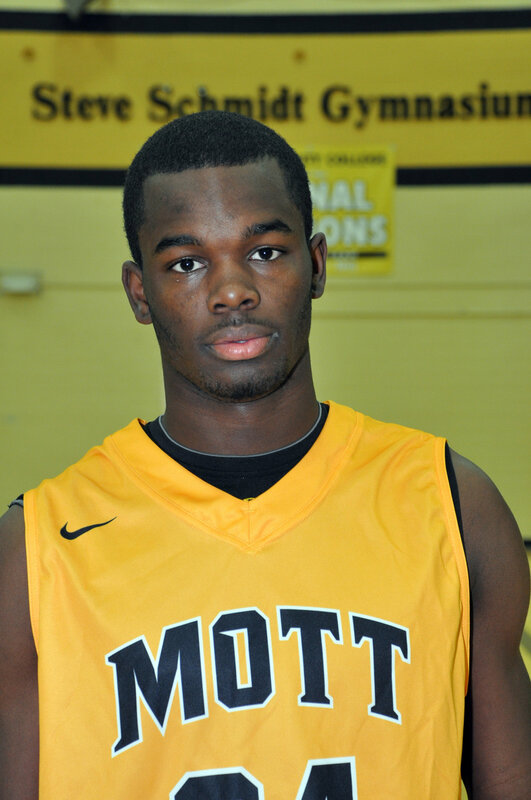 Mott sophomore Kory Billups scored 22 points with six rebounds in Mott’s win over St. Clair. FLINT, Michigan — Certainly most Mott fans expected the Bears to bounce back after their 17-game winning streak was snapped against Wayne County Saturday. An 88-65 win over a very solid St. Clair squad was probably more bounce than anyone could have expected, however. Mott (23-2) traded the lead with St. Clair five times in the first half, led by five at the break and blew the game open in the second half. The victory came relatively easy in the second half, especially considering how tough the Skippers played Mott just last month. Sophomore Kory Billups turned in arguably his best performance of the year against the Skippers, scoring 22 points on only 12 shots with six rebounds. Billups was hot early and maintained that pace. It was Billups who broke the game open with an incredible basket and foul in the lane. Once the Bears had pushed the lead into double-figures, the Skippers never got closer than 12 points. The play of the game came early in the second half when freshman guard Malik Albert scored his only basket of the game — an absolutely unreal tip-dunk from the left baseline. Albert floats like few players I’ve ever seen. Even though the final score didn’t come near resembling their first matchup, St. Clair’s Johnnie Mills once again turned in an impressive offensive performance. The sophomore from east Detroit scored a game-high 24 points. The Mattison cousins, Fred and Chavis, combined for 30 points and 24 rebounds for Mott. Freshman Devin Foster, newly re-inserted into the starting lineup, added 13 points. Mott has a couple days to prepare for the most important game of the season thus far against Oakland on the road Saturday. The Raiders are 12-1 in conference after surviving a scare against St. Clair on Saturday. The game tips at 3 p.m.
Lapeer West senior Cullen Turczyn became the Flint Metro League’s all-time leading scorer on Monday night, as the Panthers beat Holly 62-44. LAPEER, Michigan — Monday night’s victory for Lapeer West (12-5) over Holly (11-6) wasn’t simply a payback for a loss earlier in the season, but a coronation of sorts. West senior point guard Cullen Turczyn needed only 11 points to become the Flint Metro League’s all-time leading scorer. He scored 14. Turczyn, at maybe 5-foot-8, is truly one of the most unassuming standouts I’ve ever watched. He plays the game the right way — hard on both ends of the floor. Holly threw everything they had at him, and Turczyn responded with assists to open shooters rather than ill-advised shots. The record was earned for him in the fourth quarter, when he made both ends of a one-and-one. The record had belonged to former Lapeer East standout Brandon Fisher for more than two decades.